This section presents free classified ads for Clothing for sale, accessories for sale and to buy in Dublin. FREEADS in Ireland is a platform to post efficient advertisements or classifieds in Dublin. We help you find, buy, sell, rent or hire apartments, various goods for sale, local services offerings, cars, jobs and many more in Dublin. If you are not happy with ads you see on this page please use search box above to find other items for sale in category Clothing for sale, accessories and location Dublin or select another category. Manufacturer sells cheap wedding garters. Wedding collection 2011. Manufacturer sells cheap bridal garters and garters sets in assortment. Wedding collection 2011. Prices from USD 3.40. Small combined wholesale parties. 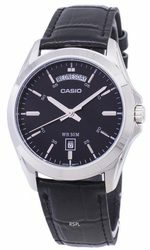 Free international shipping for order more than 100 units. Order our free catalog on e-mail. Looking for international wedding wholesalers and wedding stores owners for cooperation. My mom gave these to me for a birthday present but I never wear boots; they are brand new, designer brand John Fluevog tan leather boots fresh from the store. Originally they were $360 (bought in Hollywood at a sale for $200). I am offering them for an even bigger discount. 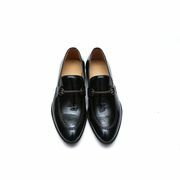 The designer has painted the toe area to make it look slightly weatherbeaten and added sparing white pain splashes to the soles of the shoe; this is part of the design. 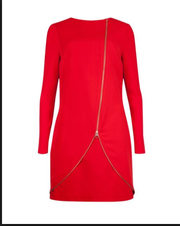 New Slash neck zip front tunic - Light Red | Dresses | Ted Baker UK. Ted Baker size 4 (UK 14). Never worn tag still on..
Missydress Ireland shop would like to present Irish girls the latest fashion of debs dresses. http://www.missydress.ie. Designer communion dress for sale in Dublin.Dry Washed and ready to use.Bought for 240 Euro.. Dresses for sale individually for €30 each. Each only worn a once or a couple of times. Excellent condition. Sizes 10/12. Bought from Miss Selfridge, Oasis, AWear. Can meet up in Dublin City Centre and in North Wicklow. Contact me for more photos if you wish..
Fab wedding dress for sale in excellent condition. Selling unworn Louboutin shoes size 40. Originally 685. Open to reasonable offers. Sell brand new UGG Shoes. Size - 11 (UK) - 45 (EU). Diesel Bootcut Jeans 32 / Waist / 32 Leg Hand Made Ring Spun 100% Authentic Receipt Included Cost €69.99 Before Sale And €56.00 Afterwards. Beautiful Designer Leather Jacket By Karen Millen Size 12 But A Small Fitting It Must Be Seen To Be Appreciated Brand New With Tags Cost €300 Unwanted Gift. Beautiful Taylor made siopa rince dress 6-8 years old approx, immaculate condition no make up or no tan used. made july 2015. Stunning on stage Measurements Waist 24 Bust 25 Length 24 Arm 17.5. This beautiful wedding dress was made to order 5 inches shorter than standard wedding dress length to suit the smaller bride. Wide neckline which is highly flattering and is heavily embellished so not many accessories are needed. The corset back also allows you to feel comfortable and would fit anywhere between a size 8-size 12. 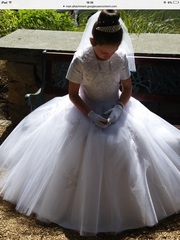 Communion Dress For sale includes communion coat, Tiara, vale, shoes, Bag watch, medal & chain ..cost over 1100 Euro but will sell for 200 Euro. 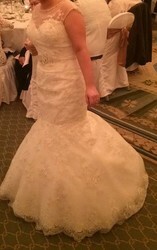 Selling My Amazing Sincerity Wedding Dress... Fabulous Venice and Rochelle Lace Fit and Flare Gown. Dress is a US size 16 and has been slightly taken in around hips and waist area and straps altered. I wear a high-street UK size 12 normally. I added a diamante belt to dress and had train shortened. Beautiful Asos dress for sale. Size 12, worn once for a few hours , selling for half original price . Would suit occasion, wedding, races .. Size 12, fabulous outfit, worn once. Bought for 200, selling for 100. Would suit for occasion , wedding , races !. Two gorgeous silver hair combs bought for a wedding but never used, can be taken as a pair or separate. Also have birdcage veil to add if interested. Will ship nationwide. Two beautiful Debs Dresses For Sale Size 10/12 Very good condition €100 each. Brand new ladies unworn navy ankle boots. Brand new never worn shoes size 7. Two Debs Dresses for Sale .. €100 each Complete Communion Outfit €130. 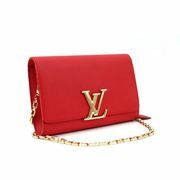 Medium double flap lamb skin Chanel bag. Just bought preloved, selling as I need the money for a jumbo size. Hello! I'm looking for a partner of a joint purchasing. Laxar - wholesale supplier and manufacturer of women's clothing. They have a lot of quality clothes and one of the lowest prices on the market. Terms of cooperation: - The minimum order - 10 positions; - the formation of the order from 1 to 5 days ( gathering of the order begins on the next day after payment is received); - delivery takes about 5-14 days. Print customised large quantity garments, gifts and homewares for anyone, no matter how large the order. Process Print personalize a cool kids birthday tee. Birthday themes include: rock, monsters, cupcakes and more! Contact us for more details http://www.processprintcc.ie/. We are selling finest collection of super soft reversible bonded jersey sweat shorts. On first order you get straight 20% discount as well. Direct Link: https://brosheets.com/product-category/loungewear/. Ireland free ads for Clothing for sale, accessories, Dublin, Clothing for sale, accessories free ads Dublin, Clothing for sale, accessories for sale Dublin, Clothing for sale, accessories to buy in Dublin. This page is a classified ads listing for Clothing for sale, accessories Dublin. This listing includes classifieds for sale and to buy in Dublin. If you posted an advertisement on Clothing for sale, accessories, Dublin before please use Edit my ads button to change or cancel your ad. Clothing for sale, accessories Dublin ads Dublin, Clothing for sale, accessories classifieds Dublin, Clothing for sale, accessories free ads Dublin, ads for sale Dublin, ads to buy Dublin, FREEADS in Ireland. Find here ads for sale, to buy and rent in Dublin. Goods for sale in Dublin, vehicles for sale in Dublin, Dublin real estate for sale, Dublin property for sale, property for rent in Dublin, business ads in Dublin, Dublin business classifieds, services in Dublin, Dublin services ads, jobs in Dublin, pets for sale in Dublin, Dublin dating, Dublin cars for sale.